The badge earner has a proven expertise to use a Big Data platform and data governance concepts to efficiently store and manage extremely large amounts of data, using IBM BigInsights. The badge earner has demonstrated advanced proficiency on topics such as Apache Hadoop, Ambari, and Spark, Big SQL, Big R, HDFS, YARN, MapReduce, ZooKeeper, Knox, Sqoop, and HBase. Must be a faculty member of a Higher Education Institution which has or is implementing the IBM Skills Academy Program in Latin America. Completion of Module I - Big Data and Hadoop Introduction: What is Big Data; Big Data Business Context; and What is Hadoop; Hadoop Business Context. Completion of Module II - Hadoop Fundamentals: Introduction to Apache Hadoop; Apache Ambari; Hadoop; HDFS; Map Reduce and Yarn; Apache Spark; ZooKeeper; Moving Data into HDFS with Sqooq; and Using Hive to access Hadoop/Hbase data. Completion of Module III - Big SQL Fundamentals: Using Big SQL to access HDFS data; Querying Hadoop data using Big SQL; Administering & managing Big SQL tables; Data federation using Big SQL; Using Big SQL operations on tables managed by HBase; and Using Spark operations on tables managed by Big SQL. 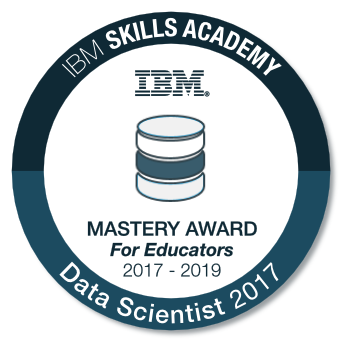 Passing the IBM Proctored Exam for "Data Scientist LA 2017".